Just yesterday, as a matter of fact, I discovered a juicy new word that I had never read or even heard of before. The word is paronomasia. Ain’t that a beaut? If you, like me, have no idea what it might mean, there’s a big hint in the subject of this post. You guessed it: that big, fancy word simply means a PUN! The ability to create puns is, sadly, a gift I was never blessed with – to the immense relief of everyone around me, I’m sure. Furthermore, in spite of my love for words, I can’t remember a pun long enough to repeat it – which is probably why I still have friends. But I can write about them. What can I say? I can’t help myself…. Why does Humpty Dumpty love autumn? Because he had a great fall. A new type of broom came out, and it’s sweeping the nation. I know a guy who’s addicted to brake fluid; he says he can stop anytime. If you take a laptop computer for a run, you can jog your memory. A grenade falling onto a kitchen floor in France resulted in Linoleum Blownapart. Okay, so it’s not a pun, but you have to admit, it’s cute! The short fortune teller who escaped from prison: a small medium at large. An adverb bumps into an infinitive in a bar. A Brief Interjection, here, re the Curse of High Apostrophe Intelligence, above: I just had to include this little image, because the poor woman groveling on the sidewalk could easily be me. Would you look at that sign overhead? Every single possessive and plural is wrong, just plain WRONG. Arrrrrrgh! Words with apostrophes just tossed in any old way make me crazy, you hear? CRAZY!!!! Whew….okay….okay, I think I’m back to normal now. Let us continue. What do you call a dinosaur with an extensive vocabulary? A thesaurus, of course! Atheism the only non-prophet organisation. What does a grape say after it’s been stepped on? Nothing; it just lets out a little wine. Oh man, every time I read it, I bust out in giggles all over again. “…a little wine” – it just breaks me up! I’m a punster. I just enjoy this! Thanks, Jude. I don’t know how brilliant it was, but I had a blast putting it together! I spent most of the time it took to create it tittering to myself. 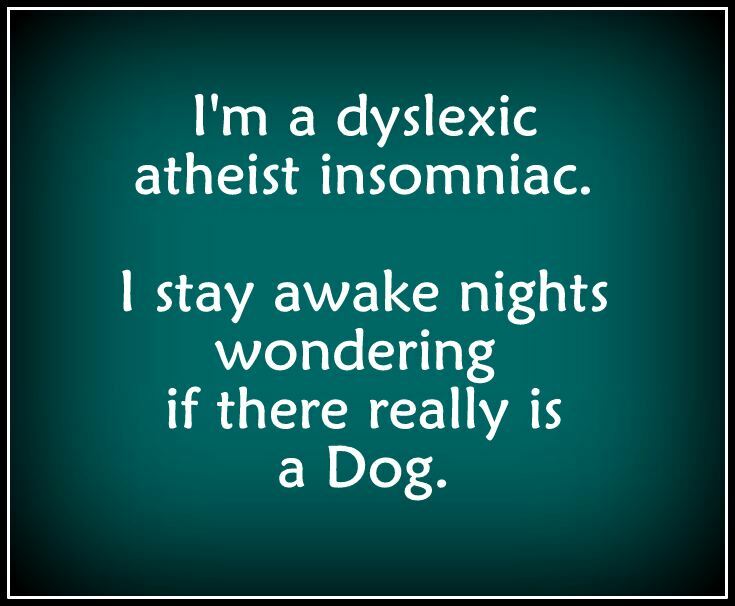 My absolute 100% TOP ALL-TIME FAVOURITE is the first one, about the dyslexic atheist insomniac wondering if there’s a DOG. Just thinking it to myself makes me giddy inside. That first one was extremely clever! Very punny! !